“We don’t have much time. I need your help to find the bomb,” says President Kirkman (Kiefer Sutherland) to Dr. Andrea Frost (Kim Raver) who he’s enlisted to help the FBI find a dirty bomb somewhere in D.C. in season two episode 16 of ABC’s political thriller, Designated Survivor. The episode begins where episode 15 left off with the discovery of a dirty bomb somewhere in D.C. Kirkman confronts the leader of East Han Chiu and tells him he suspects he has something to do with it. Kirkman warns him that until those involved have been caught and the bomb neutralized, the Secret Service will be keeping him company for his protection. Kirkman meets with FBI Director John Forstell (Reed Diamond) and they go over their approach to locating the bomb. Using various investigation tactics, they’re able to narrow down the possibilities to the eastern seaboard. As time is of the essence, Kirkman calls back Frost to get her to use her new tech to assist the FBI in finding the bomb and the bombers. At first, Frost is hesitant to work with the FBI due to the fact they tried to obtain her new tech. However, Kirkman assures her that her tech is safe and that he and the country need her help. She willing agrees to trust him. Meanwhile, Agent Hannah Wells (Maggie Q) is interrogating Joon Kim (Daniel Jun) on what he might know about the dirty bomb. He insists he knows nothing. Near the end of the interrogation, Joon passes out and has something coming out of his mouth. He’s rushed to the hospital because he seems to be poisoned. Emily Rhodes (Italia Ricci) meets with Kendra Daynes (Zoe McLellan) to talk about taking action against Cornelius Moss for leaking confidential information. First, Kendra tells Emily she needs to know where Emily got the information. With Chuck’s help Wells is able to track the bomb to a container on the docks. But, she and the disposal unit discover the container is empty. It does have traces of radiation indicating the bomb had been there. Back at the White House, President Kirkman and his staff are being moved to the bunker for safety due to the threat. Seth Wright (Kal Penn) deals with the press, acting as though it’s just another busy day at the White House. One reporter seems to suspect something is going on. He tells Seth after the press briefing that he’s gotten wind of news the cabinet has cleared their schedules. He presses Seth to tell him what’s really going on. Seth plays it off as though the reporter is wrong. Wells checks in to see how Joon is doing in the hospital and it turns out the kid pulled one over on them. He used baking soda to make it look like he was poisoned and now he’s on the run. Seth tells Kirkman, Emily, and Lyor Boone (Paulo Costanzo) about the reporter and his intel. They suggest the President take five minutes out of the bunker to do a photo op with a visiting religious group to make it look like a normal day at the White House. Kirkman agrees after convincing Ritter (LaMonica Garrett), the head of his Secret Service, to go along with it. Kendra meets with Emily again saying she can’t go after Moss because the way Chuck got the evidence that he leaked information will be thrown out in court. Emily tells Kendra she needs to defend and fight for the President, but it falls on self-righteous ears. Frost emails Chuck some new intel about who the bomber might be and where. Wells, accompanied by another agent and the bomb disposal unit, locate Joon where the bomb should be. Wells and the other agent take Joon into custody and interrogate him, but he only says they’re wrong. He claims he doesn’t know anything. Back in the bunker, Kirkman plays chess with his new VP to pass the time. She admits she doesn’t want to be president; when he left the bunker for the photo shoot it made her the Designated Survivor and it freaked her out a bit. Kirkman tells her one of the reasons he picked her to be his VP is because she doesn’t want to be president. He knows if she did become the president she would do what’s best for the country and not be ambitious. The reporter catches up to Seth as he’s trying to get to the bunker and tells him he knows something is going on. He thanks him for the tip with the email. Seth has no clue what he’s talking about. Thanks to additional intel from Frost, Chuck, Wells, and the bomb squad are able to locate the bomb in a van with only 1:20 left to disarm it. The bomb squad rise to the occasion and are able to disarm it with just three seconds left. Whew! The bomb disposal unit tells Wells the bomb isn’t dirty and is no more than a pipe bomb. Seth delivers another press briefing on the incident and is answering questions when the eager reporter asks about Moss being investigated for being a leaker. Seth says he can’t comment on it. Kendra realizes Emily leaked it to the reporter so that she would have to go after Moss. When Kendra confronts her about it, Emily’s adamant that going after Moss and protecting Kirkman is the right thing to do. FBI Director Forstell tries to talk to Wells and apologize to her for the fallout between them, but she says he needs to apologize to the President. Forstell heads to the White House and apologizes to Kirkman for his investigation into Kirkman’s wife. Kirkman acknowledges Forstell was just doing his job and that‘s all anyone can expect from him. Wells interrogates Joon and he finally breaks down and admits a mystery man kidnapped his girlfriend and warned him if he didn’t do as he was told, they would kill her. Chuck has a little more luck and is able to track the suspected bomber named Arturo to a specific location. Wells and another agent search the location and discover Arturo’s dead body. Wells realizes the bomb they found was a decoy because of all the bomb-making equipment around them. She calls Forstell to warn him the dirty bomb is in the subway. Forstell runs into the already evacuated area to get his FBI men out and just as he enters the subway entrance, the bomb goes off. The blast kills Forstell and five other agents. President Kirkman addresses the nation about the tragedy and vows to hunt down and bring those responsible to justice. Wells and other agents are able to use what Joon told them, along with a few other discoveries, to figure out the country Kunami is behind the attacks because they don’t want peace between East and West Han Chiu. Seems it would hurt their selling of arms to the countries. President Kirkman has the ambassador of Kunami brought in and confronts him with the paper trail of emails, making it seem as though Kunami is indeed behind the attack. The ambassador denies it but can’t explain away the data. In the last scene of the episode, Kirkman’s in the war room with his staff and generals planning an immediate attack on the leader of Kunami. The VP, Emily, and Boone suggest he go through diplomatic channels and protocols. Kirkman, determined to defend his country and strike back, orders the strike on Kunami. Finally, Designated Survivor has gotten back to what made it such a popular show in its first season. Season two episode 16 airing on April 4, 018 returned the series to being a political suspense thriller and not a political soap opera. The stakes are high once again with a dirty bomb (and a bomber) in the D.C. area and the target being unknown for most of the episode. The drama and intensity are back and made the hour-long series engaging and exciting to watch. 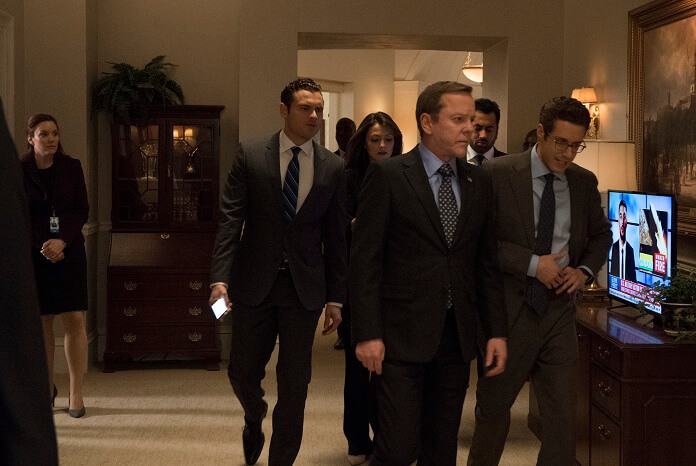 With war about to begin between the U.S. and Kunami and the possibility that someone or some other country is truly behind the bombing, Designated Survivor seems to have returned to what it does best…being an intense and suspenseful hour of television. Here’s hoping it stays that way.